We don't have a lot of stuff, so technically we could have gotten a very large Christmas tree. We do however have an indentation in our hallway that was likely designed for a phone. Presently it's a great size for a Charlie-Brown-sized Christmas tree. And that's exactly what we decided to get. I didn't see any in town, so I decided Target would be my best bet. That's another thing about San Francisco. Macy's can take up an entire city block, but Target is a no-no. Apparently it's more convenient to have Walgreen's gouge pedestrians and make the people with cars take a drive. I could have watched that thing (and the people trying to operate it) all day. But I was there for progress. I am pleased to report I made it. I found a tiny Christmas tree, that was meant to be more of a decoration. I found stockings to hang underneath it and glitter glue pens for writing our names. I found lights, tape, wrapping paper, gift labels, and a container that could store it all once it's done. I also did a little grocery shopping. I'm trying to limit my trips out there to once a month or less. When I lived in Vegas I would probably go once a week. I got used to products that I either can't find or refuse to buy in other stores. My name is Danie, and I am addicted to Target. I loaded up at Target, knowing I would either have to walk a mile from the parking garage uphill to our apartment, or park illegally, bring the stuff upstairs, drop the car off at the garage then walk the mile uphill to get home. I decided to take what I thought was the most efficient road: I parked. I put on my book bag, hoisted my large canvas bag, grabbed my gift wrap storage container with both hands, and started walking. Five blocks later - just before the hill - I remembered I live in San Francisco. 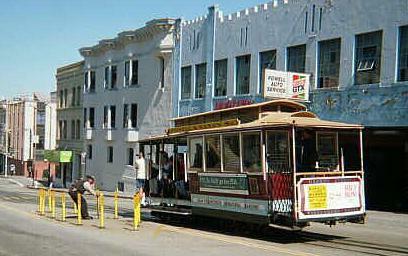 And we have cable cars for people just like me. So there I was, standing among the tourists laden with cleaning products, fruit (frozen, dried, and cupped), a tiny Christmas tree, and a storage bin. I'm sure I made for an interesting sight. I would have asked someone to take my picture, but I could barely reach my wallet. The camera was out of the question. I was at the Cable Car stop pictured above though. It was a dreary afternoon too. All that's missing is me. You can mentally insert me right there at the end of the line. Thanks. I got off at the bottom of the hill on my street. A smarter Danie would have waited and got off at the top. But there is some sort of switch that happens there. It takes time and I thought I could get up the hill faster if I were on foot. I might have beat the trolley, if not for the Jehovah's Witnesses blocking my doorway. They had accosted the mail carrier and I swear he saw me as his escape. Ernest & Steven were very pleasant. They apologized for stopping me when I was very clearly busy, but stopped me all the same. They gave me their literature and offered to come back and discuss the meaning of life with me. I was pleasant, because I know doorbell ringing is part of what they do, like not eating meat on Fridays between Ash Wednesday & Easter. Still, I will not be making myself available for chat time. After all that, it was 3:30, and I had 50 minutes to deliver Christmas before Jesse got home. I knew it was doable. I love those Target cart escalators... my old, local place in Queens had them. woah that cart escalator is TOO much! i would have stood and stared all day - effifency be damned!